PWEOB-BSX-000 - Password JDM Oil Pan Baffle - Pann Auto Performance - San Diego largest aftermarket automotive performance parts - What do you drive? Oil starvation during high g-force turns and heavy braking during road racing is a common problem. 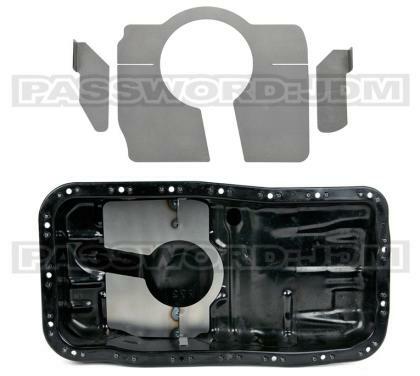 The best solution to prevent oil starvation is to install the Password:JDM Oil Pan Baffle. The Password:JDM Baffle prevents oil pressure drops due to oil shifting caused by centrifugal forces. Our kit contains three laser-cut steel pieces formed to the necessary shapes to fit your stock oil pan. After all the baffle pieces are test fitted into the oil pan, everything should be welded in permanently by a trained professional.